With innovation knocking the doors of every industry, technology has now become a basic need for survival of the business and the society at large. We heard about Artificial Intelligence, Machine Learning, and Deep Learning in 2018. Be prepared to see a convergence of them across different applications to create an unimagined future for humans. Technology trends 2019- Every industry will look at innovative ways to use technology to further improve customer experience, reduce the time to market significantly and improve operational efficiency thereby reducing operating costs. Here are a few trends which will rule the industrial growth and advancements in 2019. While there are varied emerging trends ruling the market today, we are going to discuss the most awaited trends which will gain momentum in 2019. Most of the companies are in the constant lookout for means to accelerate time to production, reduce cost and improve efficiency. On one hand the new age companies are building application cloud native, on the other hand, traditional companies are looking to accelerate digital transformation. In either case, modernization is the need of the hour to gain more market share and remain nimble in the competition. 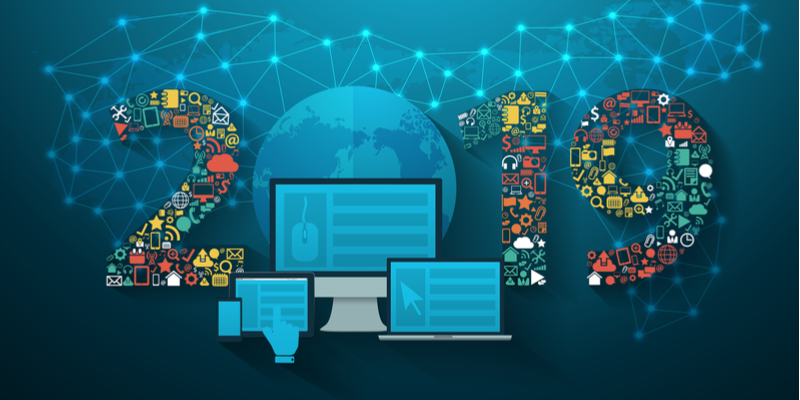 The ways new applications will be built and deployed in 2019 will be through API, Microservices and Containerization. These approaches will make applications more scalable and reduce deployment time. Microservices architecture provides a comprehensive suite of modular services and breaks down monolithic applications into self-dependent services. In the endeavour to become agile, companies are expected to increase investments in microservices. APIs allow applications to talk to each other in a secure manner. Open APIs allow enterprises to talk to FinTechs and other service providers and this will foster innovation at a higher level. In 2019, APIs will play a crucial role in European geography where regulatory measures like Payment Services Directive (PSD2) and Open Banking would mean financial institutions will increase investments on these technology trends for providing secured accesses to third parties. Application Programming Interfaces (API) and microservices are expected to coexist with traditional applications but gradually replace them to create an integrated experience and increase interactions of every business with the world. AI-based digital assistance like Alexa, Siri, or Google Assistant have increasingly grown their reach and real-time self-service options are becoming ubiquitous. While there is still a lot of hype around AI, in 2019 AI is going to be more mainstream across different segments of business and integrated with internal systems of industry-specific requirements. AI will be used within enterprises from operational to more strategic work tasks. This will be possible through advancements in Deep Learning and better usage of Neural Networks. The amount of data available to train models has increased significantly and therefore will help Deep Learning. AutoML (automated Machine Learning) algorithms will help software developers to solve complex problems without the need of creating complex models and workflow. The interoperability of neural networks has been a challenge and to fix this AWS, Facebook, and Microsoft has set up Open Neural Network Exchange (ONNX) some time back which will help reuse of trained neural networks across different machine learning frameworks. This opensource AI ML possibly will gain momentum in the next year. Apart from the software advancements, AI optimized chips build specifically AI tasks also help AI take off to a new trajectory. The post Technology trends that will outline the IT industry in 2019 appeared first on erpinnews.